Although I generally don't, lately I've been checking my Spam filter. Not that kind of spam, sillies. The unwanted email kind. I do wonder what a Spam-of-the-weird-processed-food-kind filter would look like, though. What do you think? Anyway, I've been checking the email that my spam filter has caught for me and I noticed a new one. I've been seeing the "Suspicious Activity on your Account" one for a while. I always go, separately, not clicking the link in the email, to the site to check. And there's never any suspicious activity. But this morning there was an Order Pick-up Failure notice. As in, I ordered something for in store pick-up, and they had notified me five times that it was available, but I never showed, and I needed to pick it up. Now. Except I had to click on a link to see what I had ordered and even at which location I needed to pick it up. Unfortunately, these tactics must work, because the scammers keep using them. 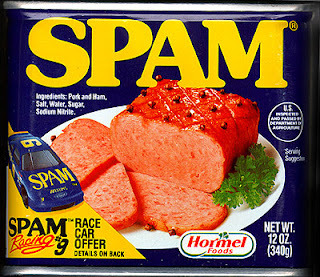 Here's something interesting, if you're wondering why spam is called spam. Might be true, but only the originators know for sure.